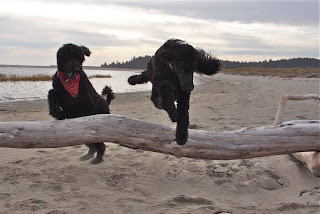 Jumping up is one of the most common problems people have with their dogs. It is actually rooted in social behavior, in the way our dogs relate to people. What Causes Dogs To Jump on People? The start of the problem goes all the way back to our habit of carrying puppies around, instead of putting them on leash as soon as possible and making them keep all four feet on the floor. Hence they get used to the feeling of being up close to our face, and still long for that type of contact even when they are older. Jumping on favorite people is very common in all types of dogs. Jumping up to greet visitors is more common in highly social breeds, such as retrievers. A more aloof type of dog, such as an Akita or a Chow, is usually not tempted to jump up on strangers. Smaller dogs, including toy and miniature Poodles and breeds like Jack Russell Terriers, are often likely to jump on people because they are used to putting their front legs up on their owners to get them to pick them up. Why is the Behavior So Difficult to Stop? Advise abounds about how to stop jumping up, yet it is one of the most common problems that dog trainers encounter. From your next door neighbor, to your veterinarian, to the trainer in the local pet supply store, all are full of advice. With all this advice readily available, why do dog trainers' phones ring every day, with folks begging for help because their dog is jumping all over people? The answer is fairly simple. Traditional advice is flawed. It either focuses totally on teaching the dog to sit instead of jump (I'll tell you in a moment why this is not the best cure) or it focuses totally on a punishment administered after the behavior has already occurred. It leaves out the two important things--one, prevention is the best cure and two, we must teach our dogs to look to us for direction and protection instead of allowing them to make their own decisions. No one lets their children run up and jump into a stranger's arms . Kids always must look to their parents for permission before they approach anyone. Why should our dogs be any different? How Do We Get To this Point? Other common advice is to lure the dog into a sit with a cookie, and ask our visitors to ignore the jumping up behavior, and reward the dog's sit with a treat. What if our dog is not food-motivated, or perhaps is so excited about visitors that he ignores the treats? Our visitors may not be savvy enough to know how to do this properly (everyone, not just the dog's owner, must be consistent with this approach). Or they may be so taken aback by a huge muscular dog jumping on them that they are afraid to reach out and lure the dog into a sit with a cookie. A better approach is to put the whole problem of jumping into the paradigm that I use for solving any type of canine behavior. Let's go through these steps quickly. 1. Identify the triggers for the behavior. Think through the times that your dog is most likely to jump on someone. Normally this will be when he is in a high state of arousal, such as when you have first returned from being away, or when a visitor has rung the doorbell. Also, realize that own body language or excited verbal greetings also can trigger jumping behaviors. 2. Avoid the triggers when possible until the dog is trained. 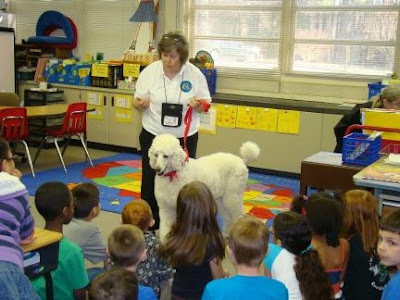 For example, if you know that your dog loves to jump up on little people, don't take him to "show and tell" at your child's school until you have him perfectly under your control. If your dog gets so excited by the doorbell that he leaps all over visitors, simply prevent this (until he is trained) by not allowing him access to the door everyone comes in. Put him in a comfy crate or with his toys in a back room, and bring him out later, after your visitors have settled in. When you do bring him out, snap his leash on as soon as he starts out of the crate and keep him under your control until you are sure he is calm enough to resist the temptation to jump. 3. Teach a replacement behavior that is incompatible with the inappropriate behavior. For example, a dog cannot sit and jump up at the same time. However, I have found that teaching dogs a reliable four-on-the-floor command, such as the stand for exam works even better than the sit (for curing jumpers). This simply means that the dog must stand, in one place, for petting, the same as he might be taught if he were at a dog show and the judge was examining him. If you would like tips on exactly how to teach this, please read the article on my Knowing Dogs blog entitled "Your Dog's Feet". 4. Choose an appropriate consequence for choosing not to obey. Once your dog has been thoroughly trained to sit or perform a stand-stay, but chooses instead to try to jump on someone, he should receive an effective correction. 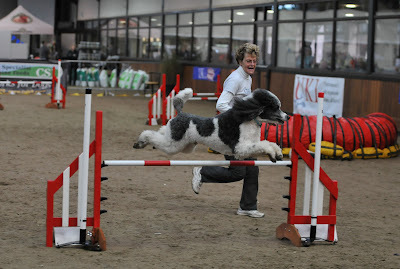 Corrections do not come after the event, but preferably just as the dog is "thinking" about jumping, so that it prevents the jump. Then quickly re-direct him back to what you have asked him to do. Use of a slip lead, or a slip collar, to give the dog a quick collar correction can easily interrupt the behavior and help the dog to re-focus on you. Your correction is simply an interruption, not a "punishment" of any sort. It is important to give the collar correction to the side, or downward, as opposed to pulling upwards. Don't feel guilty about teaching your dog what the word "no" or "stop" means. But anything verbal needs to be simple and quick, not loud or exciting (which will just up the dog's adrenaline level, making the problem worse). Like Cesar of National Geographic's Dog Whisperer fame says over and over - be calm and assertive. Loud angry corrections can either frighten our dogs, make them more excited or simply make them think we are losing control. A calm but firm "no" paired with a leash correction, then a redirect "Fido, stand....stay" works much better. 5. After your dog is reliable on the sit and stand commands at home, "proof" the exercises by practicing under distracting conditions in varying locations.. Set him up for success by keeping him on leash and practicing at least a couple of times a day for approximately a month. Keep your dog on a leash no longer than 4 feet, and do NOT give him the full length of the leash when someone approaches. It takes 21-28 day of repetition for something to start becoming an automatic behavior, meaning that the dog will just do it automatically, without thinking. We want our dogs to immediately go into proper greeting mode, like stand for petting or sit for attention, as soon as someone is allowed to approach them for greeting. 6. The most important thing in solving jumping on other people is teaching your dog that he must look to you for guidance BEFORE greeting anyone! One of the biggest reasons for over-exuberant greetings is simply that the dog has never been taught that he must wait until his owner tells him it is okay to greet someone. You would not allow your young child to just run up to any stranger and jump into their arms would you? What do most well behaved young children do when they see someone interesting? They look up to their parent to see if it is okay. We want the same response out of our dog. Even when they are excited, they must look to us for direction, and wait until we are sure the person wants to be greeted by a dog before we even allow interaction. To recap, teach the dog an appropriate replacement behavior (such as stand-stay and sit-stay.) As soon as the dog understands the replacement behavior, then add a consequence for choosing to jump up. Be quiet as you give the correction, then redirect the dog into the sit or stand-stay. Do not praise, treat or pet the dog unless he is remaining in position. If he pops up, walk into him, forcing him to walk backwards. This balanced approach of both rewarding appropriate behavior and correcting inappropriate behavior will help him learn quickly. Nationally known trainer Mary Mazzeri states "A balanced approach puts some responsibility for making choices on the shoulders of the dog. They know that they will both avoid discipline and earn rewards when they make the right choices." I could not agree more, particularly when teaching our dogs impulse control choices like proper greeting behavior. (c)2007-2014, Melanie Schlaginhaufen, all rights reserved. For reprint permission, use this Contact Link to reach Melanie. Hi everyone, two and four legged friends alike! 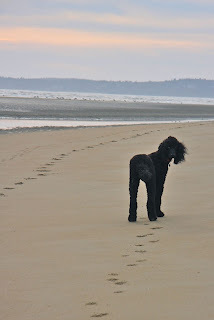 My name is Nena and the Poodle Blogger asked me to write and introduce msyelf. 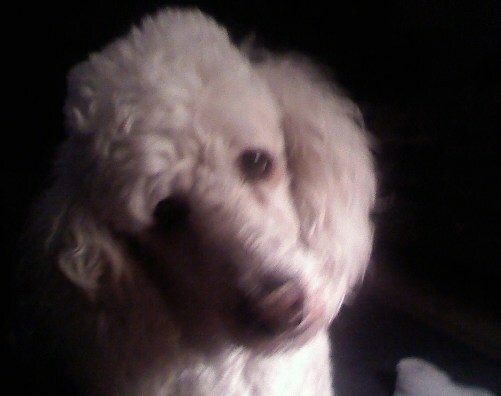 I am a 63 pound white Standard Poodle. At least that is what I've been told. I REALLY think that I am the "favorite child" of my forever parents, Diane and Marvin in North Carolina and I am very happy to claim them! But my life did not start out as happy as it is now. Ten years ago I was born in a “puppy mill”, daughter of a malnourished 36 lb mom (that is very skinny for a tall Standard Poodle). I was only two days old when many people came with law enforcement, and animal control officers and scooped all of us up. 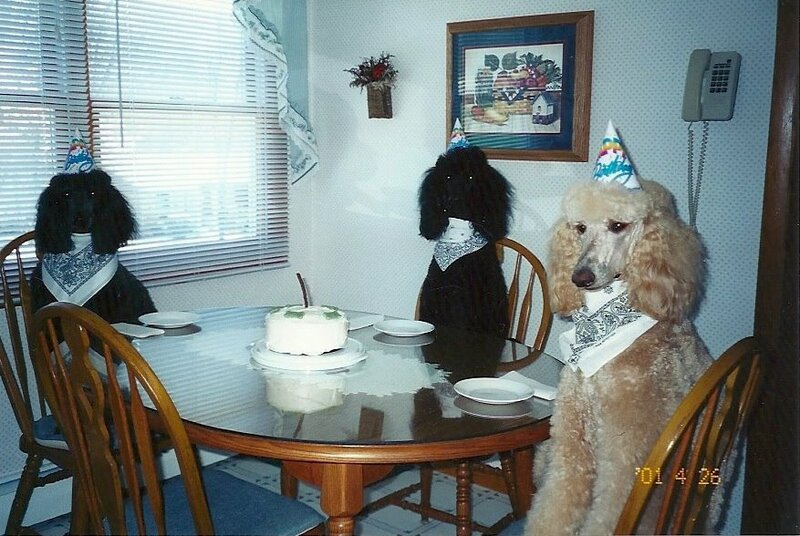 There were many more dogs than just Poodles, but since I was so young my eyes weren’t opened yet, I never met the other dogs. Anyway. these wonderful people from Florida Poodle Rescue took me in their warm safe hands and I knew I would be okay. My only brother did not survive, but my Mom and I went to foster homes where we were loved and given special care. I lived with Joani and several other Poodles for about 3 months. Then one day my forever mom drove down from NC to pick me up. We had a long 11 hour ride back to my new home, but I mostly slept, played with a toy and ate. I loved the trip and still love going anywhere in a car today. Just pick up the keys and I am ready to go! Speaking of cars, let me tell you about my favorite trips. My Mom always wanted a Therapy Dog. I was so happy to oblige because I want to help other humans in need, because they helped me when I was a baby. So Mom took me to a training class. I was a natural with all this stuff and became a certified Therapy Dog on the very first try! That test was a breeze for me. Now I get to go all kinds of places. Every month I go to the VA Hospital and help the Veterans play Bingo. Sometimes someone reaches for me but can’t quite do it so Mom carefully places my feet up on the wheelchair so I can be touched. She is special that way, my Mom. When it’s okay, she lets me lick their hands. She says she is very proud of me and my work and she was surprised when I didn’t even get scared the first time I rode in an elevator! My very favorite visits are with children. I get to go to the library and children read to me. Sometimes they even rub me while they’re reading. It feels so good. I’m actually a little sad when we have to go home. But I have a very special place that I go to every week. This is where I do my most important work. Mom takes me to the Child Advocacy Center where physically and sexually abused children are interviewed. Sometimes there is a family with several children in the room. Mom doesn’t know who is there to be interviewed, but I DO. The people watching on closed circuit TV have told mom that I go directly over to the child that needs me most, then later I make my way around the room. to visit everyone else A lot of times I feel that the staff and other adults need me almost as much. This is really my favorite place! Well, long story short, I want to thank all of you who work with rescue groups to help lost, abandoned, abused and homeless dogs find a loving nurturing forever home just like someone did for me. Note from Melanie...thank you Nena, and thanks to your Mom who typed this article for you! And special thanks to all of those who participated in your rescue and continue to do wonderful work saving Poodles of all varieties, at Florida Poodle Rescue. Scotty, you and your Mom and your brother Joey are soooo pretty! Looks like Chris L'Abbe's boys had some fun over the holidays...they sent these photos for us to enjoy! "Umm...should we just pose here, or is this possibly a piece of agility equipment?" "Wow, Mom, this really is a cool jump, way cool!" "We are just lovin' this new jump!" "Mom, please let me take it home, it's just a little stick!" "No, it's not really time to go home already, is it?" 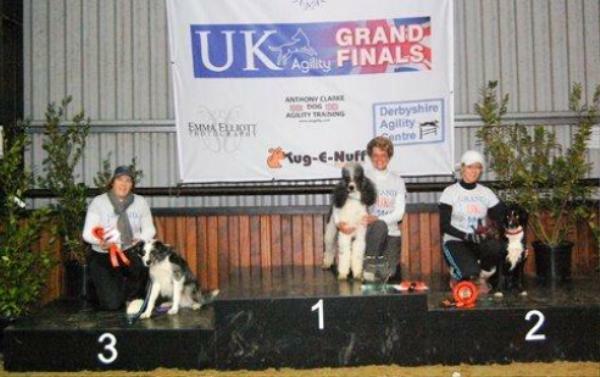 Parti Poodle Takes Top Honors at U.K. Agility Grand Finals! 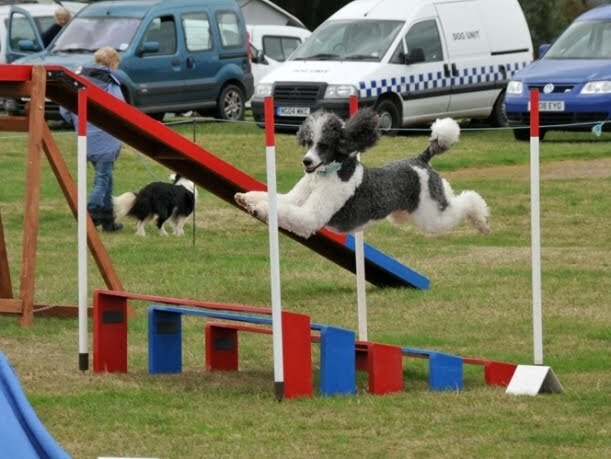 When I recently heard that a Standard Poodle had beat out all the other breeds (yes, including Border Collies, who took 2nd and 3rd place) for top honors in agility in the UK, I wanted to know all about it! "Blaze", Kit Sue’s UK Trailblazer for Tisane, is a gorgeous parti-colored blue and white boy, who was imported by his owner Sara Bingham in 2007 when he was a year old. His very proud breeder is Sue Ablen of Kit-Sue Kennels in the United States. Sue was kind enough to put me in touch with Sara so I could learn a bit more about this winner of the UK Agility Grand Finals and introduce him to my readers. When I spoke with Sara by phone, I realized that her dog Blaze is quite an amazing ambassador for partis in the U.K. This color is still quite rare in her country. 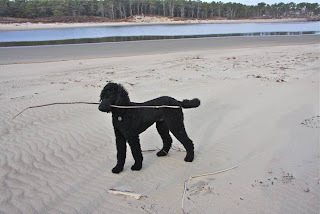 In fact, to the best of her knowledge, Blaze was the first male parti-colored Standard Poodle in England since the 1970’s (Sara states that by then they had been culled out of the British lines.) A great deal of thought was put into his selection, since Sara has a passion for the breed and wanted to import something very special to re-introduce the parti-color in her country (note: the British spelling is actually parti-coloured). 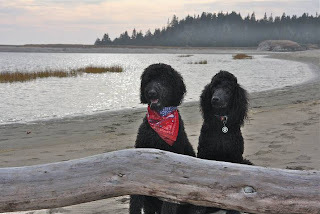 Sara is a founding member of The Parti Poodle Club there and says she feels very fortunate that Blaze has turned out to be a dog of outstanding quality, conformation-wise, in addition to being a dog of truly amazing intelligence. Blaze simply "loves to learn". 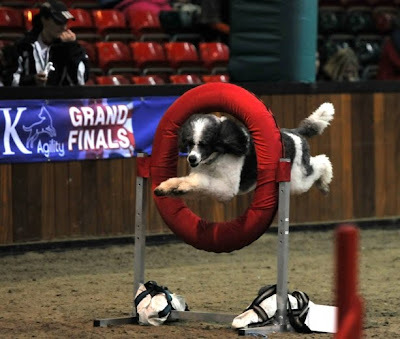 He loves not only the agility ring but also loves learning new tricks, such as saying his prayers. We spoke of our mutual admiration of Charlene Dunlap in the US who trains her parti-colored Poodles to perform all types of tricks and special behaviors for movies she makes of them. Sara said she wishes Charlene were closer, as Blaze would love to a chance to cameo in a movie to show off his tricks, since he catches on quickly to anything she teaches him. Actually, from what I am hearing, Blaze is already quite well known, a star in his own right, in his country. Blaze seems to be a dog blessed not only with lovely conformation and flashy markings, but a temperament to match. Sara says on occasions when they are out walking and Blaze has met dogs who like to start trouble, he just takes a quick look at them, then does a little skip on the sidewalk as if to say "suit yourself, and on you go!" Since he loves all dogs and all people, he doesn't have any understanding of dogs who feel otherwise! Sara and Blaze have been invited by The Kennel Club to participate in the agility demos at Crufts (the world's most prestigious dog show) for the last two years, and an invitation is expected in the mail any day to participate again this Spring. We look forward to seeing more photos and hearing more about Blaze's accomplishments in the future. 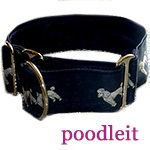 In the meantime, you can see more of Sara's Poodles and read about her plans to revive the parti Poodle in the UK by checking out her website: www.ukstandardpartipoodles.co.uk. Be sure to visit the page entitled "The Parti Poodle" for a short but very informative article about the history of this color in Poodles. 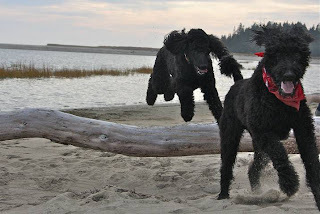 Coming soon to the Poodle Blog...a You Tube clip of one of Blaze and Sara's runs! Otis does not look like the same dog, does he? There is a different spirit in his eyes now, a confidence that has come from knowing how greatly he is loved. Thank you for sharing these Shirley...a picture really is worth a thousand words! And these pictures tell a story that is priceless, worth much more than a thousand or a billion words to me, a story of love and restoration. Today marks the one year anniversary of my favorite New year's gift ever. Last year on New Year's day I was blessed with the adoption of "Josh Turner" now named Otis Milligan. I had searched many months to find the perfect rescue dog for our family. Since my husband and I were recent retirees and travel extensively, we needed a small, easy tempered little guy that enjoyed long rides and lots of love. One day in December 2010, I was searching through Petfinder online and saw a picture of little Josh Turner. I knew immediately that I was his human. I told my husband that he was the one. 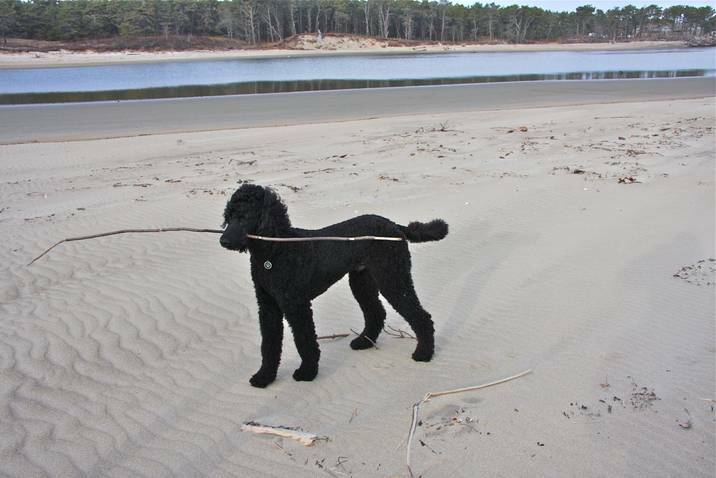 We immediately started the application process through Carolina Poodle Rescue. When we brought him home, he would not bond with anyone except me. He was so afraid that everyone would be mean to him. He didn't want me to even sit him down. His teeth were in bad shape due to years of neglect and it was obvious that it hurt for him to eat. I took him to see our vet, Dr Causey, (a wonderful man who loves all animals as his own). He pulled all the decayed teeth and repaired his gums......leaving Otis with only his canines, 8 teeth in all. Ironically, it only enhanced little Otis' appearance. His little tongue sticks out almost all the time, making him even cuter, (we refer to his tongue as his "happy meter" - the more it sticks out, the happier he is). As Otis starting healing, it was amazing how much more he wanted to play; he developed a spring in his step and a wag in his tail! Since Otis had apparently always lived in a cage, he didn't understand that he could actually walk in a straight line. He would always circle left, round and around........he even got the nickname "Nascar" from our local "dog whisperer". It took a couple of months before he was comfortable walking beside me in a straight line on his leash......slowly, everyday he became more and more the dog he was meant to be. One of our biggest milestones was the first time he actually walked around the block on his leash without begging me to pick him up...when we got home, it was like he realized he had made it without any help and it was fun! From that day, he has always looked forward to his morning stroll. Trust was an issue that didn't come as easily. He has never growled or snapped at me but everyone else seemed to be fair game. For months, he would have bad dreams at night, (I can't and don't want to imagine what his life was like to make him so afraid of humans). At first, he tolerated my husband, Patrick, (letting him sit next to us on the couch and allowing him to pet him but not pick him up). Slowly he let him into our circle and now, he loves Patrick almost as much as me. Other humans took much longer. It has only been in the last few months that he has opened up and actually seeks out other humans. He isn't afraid anymore; he only sees goodness in humans. Otis has become the neighborhood "giggle" dog. You can't look at his sweet little face with his "happy meter" hanging out without a smile and a giggle. Everyone loves him and ask about him. He has brought me such joy and love. I am so fortunate that the good people of Carolina Poodle Rescue were the angels that took in my little boy. Our one year anniversary has been made even sweeter with the news that little Porter Wagner - the first dog of the 12 dogs of Christmas has been placed. Porter was the leader and protector of the small pack of 4 that made their way to the sanctuary of Carolina Poodle Rescue. All the angels along the way for Otis: Porter who helped to protect him in the wild; the forest rangers who captured him; the rescue group who worked to find him a shelter; the beautiful and wonderful staff of Carolina Poodle Rescue whose hearts are larger than life; and our dear vet, Dr. Causey - we thank you from the very bottom of our hearts.....there aren't words enough to express our sincere gratitude for all your efforts. 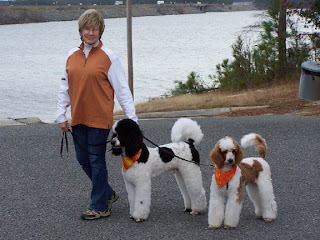 Thank you , thank you , thank you, Carolina Poodle Rescue!